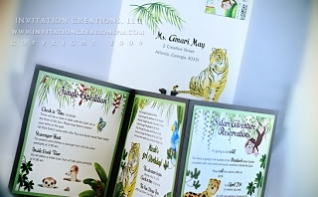 Angela lives in California and decided to call me earlier this year because she fell in love with my jungle invitations. In particular, the Let’s go bananas invitation. Her soon-to-be 3 year old son would be having his own safari birthday. 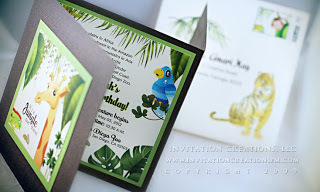 Since his birthday event would be at the Sand Diego Zoo, she wanted an invitation that reflected the venue and the type of birthday party it would be! And talk about an awesome birthday party, the children and the parents would be enjoying a scavenger hunt throughout the park and the guests without children would be getting a behind-the-scenes tour of The San Diego Zoo! Who wouldn’t want to go to that kind of birthday party? To top it off, we added custom stamps and matching calligraphy for the envelopes. 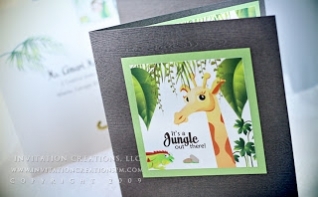 Thanks Angela, for letting me create these wonderful invitations for your son!